The following terms and conditions of use apply to all visitors to or users of the juicycouturebeauty.com website (the "Site"). By visiting the Site, you accept without limitation or qualification these terms and conditions. Juicy Couture Beauty, Inc. ("Juicy Couture Beauty") reserves the right to change these rules and regulations from time to time at its sole discretion. Your continued use of the Site following the posting of changes means that you accept and agree to the changes and are bound by any such revisions. You should therefore periodically visit this page to review the current rules and regulations. In the case of any violation of these rules and regulations, Juicy Couture Beauty reserves the right to suspend or terminate your access to the Site without notice, as well as all other remedies available to it by law for such violations. These rules and regulations apply to all visits to this Site. All materials contained on this Site are the copyrighted property of Juicy Couture Beauty. Juicy Couture Beauty hereby authorizes you to copy materials published by Juicy Couture Beauty on this Site solely for your personal, non-commercial use. No other use of the information is authorized. Everything you download, the software, plus all files, all images incorporated in or generated by the software, and all data accompanying it, is considered licensed to you by Juicy Couture Beauty. In consideration of this authorization, you agree that any copy of these materials that you make shall retain all copyright and other proprietary notices in the same form and manner as on the original. Except as specified above, nothing contained herein shall be construed as conferring by implication, estoppel or otherwise any license or right under any patent, trademark or copyright of Juicy Couture Beauty or any third party. ALL CONTENT, INCLUDING, BUT NOT LIMITED TO, TEXT, GRAPHICS, DESIGNS, STRUCTURE, "LOOK AND FEEL," ARRANGEMENT OF THE CONTENT, SOUNDS, MUSIC, ARTWORK, USER INTERFACES, VISUAL INTERFACES AND PROGRAMMING ON THIS SITE IS PROTECTED BY COPYRIGHT. EXCEPT AS SPECIFICALLY PERMITTED HEREIN, NO PORTION OF THE INFORMATION ON THIS SITE MAY BE REPRODUCED IN ANY FORM, OR BY ANY MEANS, WITHOUT PRIOR WRITTEN PERMISSION FROM JUICY COUTURE BEAUTY. VISITORS OR USERS ARE NOT PERMITTED TO MODIFY, DISTRIBUTE, PUBLISH, TRANSMIT OR CREATE DERIVATIVE WORKS OF ANY MATERIAL FOUND ON THIS SITE FOR ANY PUBLIC OR COMMERCIAL PURPOSES. Any communication or material you transmit to the Site by electronic mail or otherwise, including any data, questions, comments or suggestions, or the like is, and will be treated as, nonconfidential and non-proprietary. 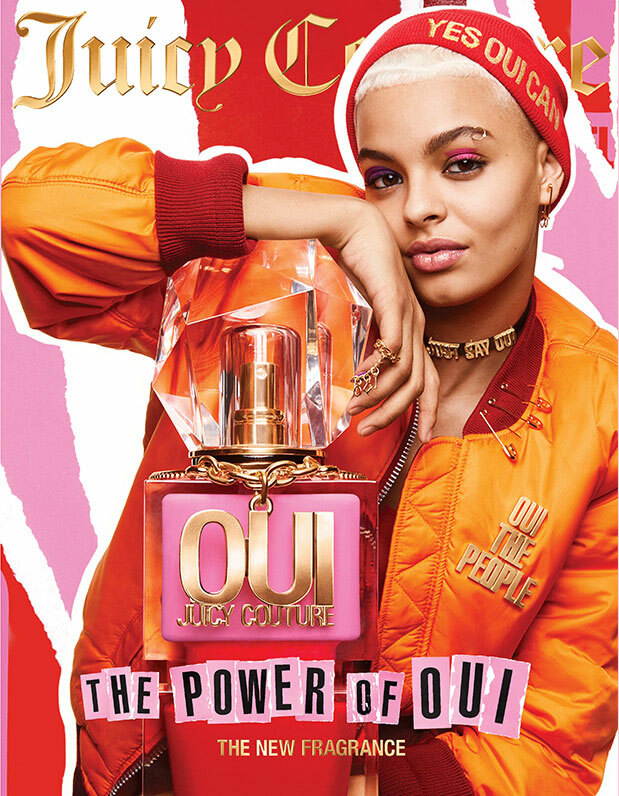 Anything you transmit or post may be used by Juicy Couture Beauty for any purpose, including but not limited to, reproduction, disclosure, transmission, publication, broadcast and posting. Furthermore, Juicy Couture Beauty is free to use any idea, concepts, know-how, or techniques contained in any communication you send to the Site for any purpose whatsoever including, but not limited to, developing, manufacturing and marketing products using such information. Images of people or places displayed on the Site, if any, are either the property of, or used with permission by Juicy Couture Beauty. The use of these images by you or anyone else authorized by you, is prohibited unless specifically permitted by Juicy Couture Beauty. Any unauthorized use of images may violate copyright laws, trademark laws, the laws of privacy and publicity, and/or communications regulations and statutes. The trademarks, logos and service marks ("Marks") displayed on this Site are the property of Juicy Couture Beauty, its affiliates or other third parties. Nothing contained on this Site should be construed as granting, by implication, estoppel, or otherwise, any license or right to use any Mark displayed on the Site without the written permission of Juicy Couture Beauty or such third party that may own the Mark displayed on the Site. Your misuse of the Marks displayed on the Site, or any other content on the Site, except as provided herein, is strictly prohibited. You are advised that Juicy Couture Beauty will aggressively enforce its intellectual property rights to the fullest extent of the law, including the seeking of criminal prosecution. "JUICY COUTURE BEAUTY" is a trademark of FD Management, Inc. Although Juicy Couture Beauty has attempted to provide accurate information on the Site, Juicy Couture Beauty assumes no responsibility for the accuracy of the information. Juicy Couture Beauty reserves the right to do any of the following at any time without notice: (i) to modify, suspend or terminate the operation of or access to the Site; (ii) to modify or change the Site or any portion of the Site or its programs or products mentioned; or (iii) to interrupt the operation of the Site or any portion thereof for maintenance or other changes. Mention of non-Juicy Couture Beauty products or services is for information purposes only and constitutes neither an endorsement nor a recommendation. ALL INFORMATION PROVIDED ON THIS SITE IS PROVIDED "AS IS" WITH ALL FAULTS WITHOUT WARRANTY OF ANY KIND, EITHER EXPRESSED OR IMPLIED. JUICY COUTURE BEAUTY DISCLAIMS ALL WARRANTIES, EXPRESSED OR IMPLIED INCLUDING, WITHOUT LIMITATION, THOSE OF MERCHANTABILITY, FITNESS FOR A PARTICULAR PURPOSE AND NONINFRINGEMENT OR ARISING FROM A COURSE OF DEALING, USAGE, OR TRADE PRACTICE. JUICY COUTURE BEAUTY, ITS OFFICERS, DIRECTORS, EMPLOYEES, SHAREHOLDERS, AFFILIATES, AGENTS, SUCCESSORS OR ASSIGNS, SHALL NOT BE LIABLE FOR ANY INDIRECT, SPECIAL, CONSEQUENTIAL, OR INCIDENTAL DAMAGES INCLUDING, WITHOUT LIMITATION, INTERRUPTION OF BUSINESS, SYSTEM FAILURES, INCLUDING VIRUSES OBTAINED DURING HYPERLINK, LOST PROFITS OR REVENUES, COSTS OF REPLACEMENT GOODS, DATA NON-DELIVERY, MISDELIVERY, CORRUPTION, DISTRUCTION OR OTHER MODIFICATION LOSS OR DAMAGE TO DATA ARISING OUT OF THE USE OF OR INABILITY TO USE THIS SITE, ANY JUICY COUTURE BEAUTY PRODUCT OR LINKS TO ANY THIRD PARTY WEBSITE FROM THE SITE, DAMAGES RESULTING FROM USE OF OR RELIANCE ON THE INFORMATION PRESENT, EVEN IF JUICY COUTURE BEAUTY HAS BEEN ADVISED OF THE POSSIBILITY OF SUCH DAMAGES, INACCURACIES OR OMISSIONS IN CONTENT, AND EVENTS BEYOND OUR REASONABLE CONTROL. Juicy Couture Beauty may make changes to any products or services offered on the Site, or to the applicable prices for any such products or services, at any time, without notice. The materials on the Site with respect to products and services may be out of date, and Juicy Couture Beauty makes no commitment to update the materials on the Site with respect to such products and services. This Site may contain links to third party web sites. These linked sites are provided solely as a convenience to our visitors. Access to any other Internet site linked to this Site is at the user's own risk, and Juicy Couture Beauty is not responsible for the accuracy or reliability of any information, data, opinions, advice or statements made on these sites. Your linking to any other site is at your own risk. You should review the terms and conditions of use and privacy policies of all third party web pages and other websites that you visit. You agree to defend, indemnify and hold Juicy Couture Beauty and its affiliates and subsidiaries, harmless for any loss, damages, or costs, including reasonable attorney's fees, resulting from any third party claim, action or demands resulting from your use of the Site. You also agree to indemnify us for any loss, damages, or costs, including reasonable attorneys' fees, resulting from your use of any data gathering and extraction tools or any other action you take that imposes an unreasonable burden or load on our infrastructure. If you have any questions, comments or concerns about our website or these Terms and Conditions of Use, you may email us at cs@juicycouturebeauty.com. Any comments or feedback you provide shall be deemed to be non-confidential and Juicy Couture Beauty shall be free to use such information on an unrestricted basis. This Terms and Conditions of Use statement is effective and was last updated on September 20, 2018.